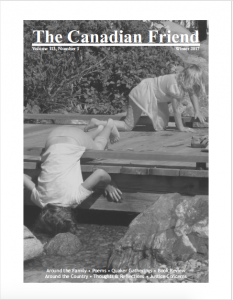 Calling all Canadian Quakers to submit artwork, articles, poetry, reflections and news for the next edition of The Canadian Friend! The theme for our upcoming spring/summer issue is ‘Faith in Action’. What is the role for faith during the troubled times in which we are living? Is there a special quality to activism motivated by God / a leading / love? What does scripture / Quaker writings / Quaker experience say about taking action on social and environmental justice? Have you had a personal experience of being spiritually moved to act on an issue or injustice? If you are moved to submit something on this theme – or to send something entirely different – please send in your submission by June 15 to: editor@quaker.ca. If you have questions about what to submit, be inspired by The Canadian Friend back issues or contact me for details. Camera-ready advertisements also most welcome. Quaker Concern has a new website – and a long and rich history reporting about Friends’ service work via the Canadian Friends Service Committee (CFSC). The oldest copy of Quaker Concern still in the basement of Friends House in Toronto is Volume 2, Number 3, dating from 1976. It’s shocking to see that the cover story of this issue, about logging and mercury contamination in Grassy Narrows in northern Ontario, is still relevant today. Canadian Friends Service Committee (CFSC) was founded in 1931, uniting Friends from the then three different Yearly Meetings in Canada to work collectively on shared concerns of peace, integrity, equality, simplicity, community, and respect for all creation. 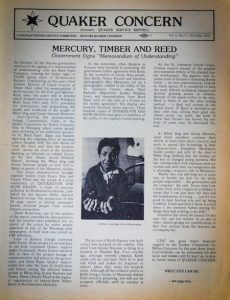 The Quaker Reporter was established to report on the service work Friends did within CFSC, and in 1975, the publication was renamed Quaker Concern. Articles from the earliest Quaker Concern reflect active threads within CFSC’s program work today. Canadian Friends Service Committee (CFSC) continues to support the long struggle for justice as mercury continues to poison the people of Grassy Narrows. The Ontario and federal governments have finally made promises about remediation work to address the remaining mercury, and we must continue to hold them to account for these promises. In other articles from this 1976 issue we read about Friends’ concerns for peace internationally and for the treatment of people who have committed a crime. We see a powerful letter written by someone incarcerated in Toronto’s Don Jail, discussing the importance of social justice and positive change before reconciliation can truly be achieved. CFSC’s work continues to centre around criminal justice, peace, and Indigenous Peoples’ human rights, with a focus on themes like reconciliation. 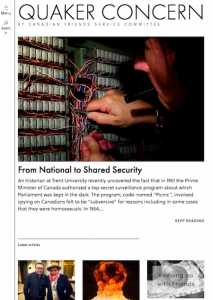 We continue to send a print copy of Quaker Concern to more than 2,000 people in Canada and 18 other countries. 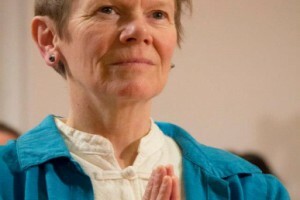 We have now added a website quakerconcern.ca to help share Quaker Concern with a wider audience. It is fitting that the first issue of Quaker Concern on the new website features an article by Murray Thomson, who also had an article in Quaker Concern in 1976. It is a testament to Friends’ quiet and steady work for positive change. This work has achieved so much, yet it is fragile, and can easily be eroded as the conditions for just peace turn into conditions of injustice and war. So CFSC’s work remains important, and we thank everyone who has been a part of it. Submitted by Matthew Legge in his role as Communications Coordinator for CFSC. Welcome to Our New Bookkeeper! We are delighted to welcome Lorraine Burke as our new CYM Bookkeeper! Lorraine comes to us with many years of experience working with non-profits and charities and she is familiar with Quaker Meetings and Testimonies. Currently she is working one day a week and can be reached at cym-bookkeeper@quaker.ca / 613.235.8553 / 888.296.3222. It has already been a seamless transition welcoming Lorraine into the role. We are happy to have you join our community, Lorraine! Our Intervisitation Working Group will sponsor your members’ visits to our Annual Session and will serve as your hosts. We enthusiastically welcome all visitors from across the entire Quaker spectrum. Baltimore Yearly Meeting is able to pay full costs of registration, as well as room and board at Hood College, for up to two members of your Yearly Meeting. These funds are available on a first-come, first-serve basis, so early registration is recommended. If you wish, you may request partial support rather than the full registration, room, and board offered. So we may reserve funds for as many visitors’ registrations as possible, we are unable to cover travel or visa expenses. From its beginnings in 2005, our Friends in the intervisitation program have visited with and welcome visitors from all Yearly Meetings of North America, as well as around the world. We enjoy the presence of and being present with Friends all over, finding deep joy in our diversity. For more information, please go to www.bym-rsf.org/events/annualsession/ or call the Yearly Meeting office at 301-774-7663. Please say that you are coming as part of intervisitation. Those accepting the offer to cover registration costs, or anyone with any further questions about intervisitation, should contact the working group at bymintervisitation@gmail.com, with a copy to its clerk, Rebecca Pickard, at deathquaker@gmail.com. Travel Minutes or Letters of Introduction from your community are encouraged but not required. We read travel minutes at our meetings for worship with a concern for business. We hope your visitors can join us not just this year but also at subsequent annual sessions, thus coming to share with us more deeply. Our Annual Session begins after lunch on Monday, July 31, with a retreat that extends through lunch the following day. Business sessions and worship, interspersed with worship sharing, Bible study, engaging evening speakers, afternoon workshops, interest groups, and rich fellowship including recreational activities full of music and fun begin after lunch on Tuesday, August 1. We close with meeting for worship and lunch on Sunday, August 6. The Intervisitation Working Group sponsors evening gatherings and workshops. With our 2017 program theme – “Growing Toward Justice – Acting on Faith” – together we will seek to understand and discover ways to “live in that life and power that will take away the occasion” for the tragic violence, injustice, and lost human potential that begins in childhood and extends into entire communities. We look at the tragedies of gun violence, substance abuse, untreated mental health issues, mass incarceration, etc. and ask what caused these situations and how can we work to prevent them in the future. Can we speak to issues starting in earliest childhood and reaching into a person’s adult life that sowed the seeds of a violent and unjust world? We are concerned that too many children are born into dysfunctional or harmful situations, that schools do not have adequate resources and support for struggling children, that there are not opportunities for positive activities to encourage creativity or wholesome sports, that discipline too often reinforces negative self-images instead of offering mediation, mentors or educational alternatives, and that too many young adults are not adequately prepared for meaningful employment. And what stands in the way of our responding to the call to act? Fear too often holds us back from engaging meaningfully with others. As T.S. Eliot wrote “between the idea… and the act falls the Shadow” (The Hollow Men (1925). Will we hesitate to share our lives with those with whom we might interact? Will we indulge our fear that they won’t like us, that we’ll make mistakes, that it will take too much time or require too much commitment, that we’ll not know what to say or do? Ottawa Monthly Meeting is seeking a Friend or attender to serve as Resident Friend for a one-year renewable term beginning September 1, 2017. An apartment is offered in exchange for about 12 hours of duties a week. The Resident Friend helps the Monthly Meeting fulfill the elements of its life as a community: looks after the Meeting House and garden, books the facilities, and handles telephone and email enquiries. Detailed guidelines are available upon request. The apartment is a second-floor, one-bedroom unit with a private street level entrance, in the Meeting House in the Glebe area of Ottawa.